Please take a few minutes to read this Melbourne Passenger Guide to help explain how it all works on the day of your flight. Please check all details of the flight date and phone numbers are correct on your booking correspondence. It is important that you call us on 1800 HOT AIR (1800 468 247) or +61 3 9427 0088 if changes are required. Bookings are available 7 days of the week. If you have not had a date allocated to your voucher please contact our office to check availability. Your ticket is valid for use for 12 months from date of purchase. Please book your flight to take place prior to the last month of your ticket’s validity, as ballooning is weather dependant, and may take a few attempts to get your flight, and weekends will likely not be available to tickets booked beyond their initial 12 month validity. or change your flight date, we require a minimum of three (3) full business days to replace you on a flight. Larger groups of 4 or more passengers require five (5) full business days notice to cancel. A business day does not include weekends or public holidays. Passengers failing to turn up for their flight are considered “No Shows” and will not be rebooked or refunded. We meet our passengers and depart as a group from the main lobby of Grand Hyatt Melbourne. on the corner of Collins and Russell Streets. (See Map). 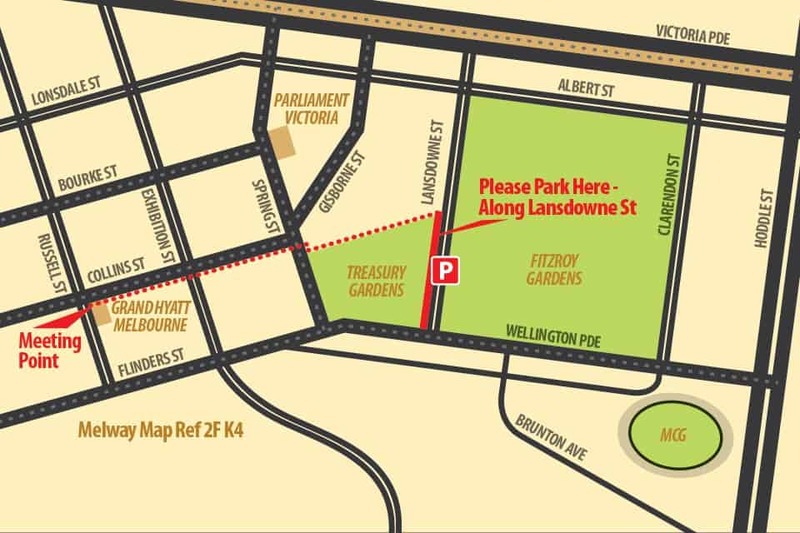 Parking is available a short walk from Grand Hyatt Melbourne, on Lansdowne St (see red line on map). All day parking is 80c per hour on Lansdowne St. $5.00 will run until 12.30 p.m. Parking is free on Sundays. Please allow enough time to park and get to Grand Hyatt Melbourne on time, as our departure times are strictly adhered to. We will only call you if the flight is going ahead. Please do not come to Grand Hyatt Melbourne if you have not received a wake-up call. No wake-up call confirms there is no flight for the morning. NO CALL means NO FLIGHT! Call Chris on 0418 878 818 only if you are lost or running late. We celebrate the occasion of our flight with a delicious fully cooked breakfast including champagne at Grand Hyatt Melbourne, corner of Russell Street and Collins Street. Family and friends are very welcome to join us for breakfast after the flight for $40.00pp. No Food or Drink to be taken on our bus. Ballooning provides budding photographers with a fabulous opportunity to snap away as the balloon basket is completely stable during the flight, be sure to charge the batteries. Balloon Flights Over Melbourne require certain weather conditions to ensure great views and we will never compromise your safety. Each morning we study Melbourne’s prevailing weather conditions, using this information we then flight plan for an hour’s flight time and determine our launch site for take off. The duration of the flight and the flight path vary daily according to the weather and wind conditions, our flights usually last about an hour. No flight path or duration can be guaranteed. Your balloon flight may be cancelled due to inclement weather conditions; you then have the opportunity to re-book another day.